A project typically consists of a list of activities to be carried out. Each of the activities may require different amount of time to complete and some of the activities may be interdependent on one another. For example, a particular activity may require another activity to complete before it can start. When the number of interdependent activities increases, the entire project becomes complex and difficult to understand. This complex list of activities is also known as the "Work Breakdown Structure" in project planning. How much time a project will require taking into account all the dependencies of the activities. Which activities are "critical" or "on the critical path" that need to be completed on time to avoid delaying the whole project. The slack time of the activities. An activity with slack time can be delayed without delaying the entire project. Activities not "critical" usually have slack time. One of the motivations of postponing an activity is the savings of labor and warehouse costs until it is necessary. The Critical Path Method was developed by Du Pont in the 1950s and is now considered one of the most widely used technique in project planning and scheduling. This spreadsheet allows the project manager to perform project planning through the Critical Path Method. All the activities are first entered into the spreadsheet. This is followed by providing the amount of time required for each activity and specifying the dependencies. After which, a Gantt Chart will be automatically generated and the critical path of the project will be determined. The critical path of the project is the sequence of project activities which add up to the longest duration. This is also known as the amount of time that the project will require. A delay in any of the activities on the critical path will result in a delay in the entire project. In the diagram above, the darker shade of black on the Gantt Chart shows the critical path. All activities on this path will need to be completed on time to avoid delaying the project. Item E is shown with a lighter shade of black. This activity is not on the critical path and can be delayed without affecting the completion date of the project. 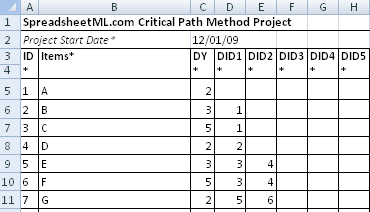 Critical Path Calculation Overview In calculating the critical path, the spreadsheet automatically goes through a forward pass to determine the Early Start/Early Finish time of the project. After which, a backward pass is performed to determine the Late Start/Late Finish of the project. This process also determines the slack time allowed for each of the activities. The calculations also take into account weekends and holidays. This document will not go into the details of the calculation to determine the critical path. Project Start Date* - The start date of the project. The spreadsheet will be generating 12 output worksheets for tracking a project over a 12-months period. 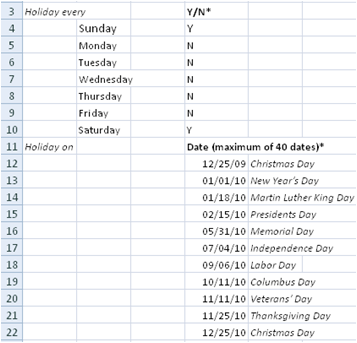 The start date allows the spreadsheet to determine which month to start generating the schedule. DIDx* - The predecessor's ID. The predecessor item needs to be completed before the start of this item. A maximum of five predecessors can be specified. The Critical Path Method spreadsheet allows weekend and holidays to be defined and encompassed into the schedules. In the diagram below, the first section shows the definition of a weekend. A "Y" will indicate the particular day of the week is a weekend holiday. This spreadsheet outputs a 12-months schedule in 12 different worksheets. Each worksheet will display the schedule for a particular month. The worksheets are named "Month 1", "Month 2" and "Month 3" etc. In each of the worksheet, a Gantt Chart is included to show the critical path of the project. The following fields are automatically calculated using the Project Start Date, Items duration and dependencies. Early Start Time - The earliest date that an activity can start. Early End Time - The earliest date that an activity can be completed. Late Start Time - The latest date that an activity has to start to avoid delaying the project. Late End Time - The latest date that an activity has to complete to avoid delaying the project. The darker shade of black shows activities on the critical path while the lighter shade of black shows activities not on the critical path. The "x" shows the holidays defined in the "Holidays (Input)" worksheet.